No need to look for any plants flowering yet here with much of our yard still covered in snow. Some insects and arachnids are emerging although, as our temperatures reached into the low 50's this weekend. We spotted several muscid flies, small beetles, spiders and one moth this weekend. 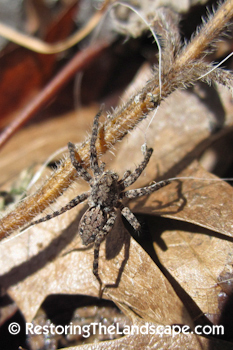 This Thin Legged Wolf Spider was hunting around in the leaf litter on our sunny west slope. These spiders prey upon insects in the soil. A great reason to leave a good layer of leaf litter. At the local park this Fishing Spider was hanging out on some Cattail stems hunting for insects on the water. 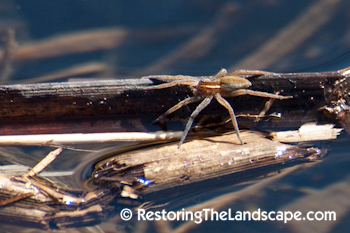 These spiders submerge several legs in the water to detect the water ripples from their prey. 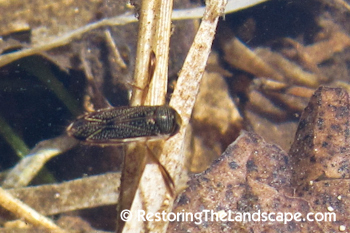 The water is just opening up around the edges of our lakes and larger creeks and we saw several Water Boatman bugs in the shallows. Their one set of oversized legs act as oars to help propel them through the water in a jerking motion. 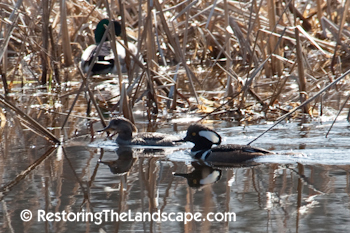 The openings in smaller creeks are crowded with Canada Geese and Mallard Ducks. We searched for Wood Ducks and found instead male and female Hooded Mergansers. 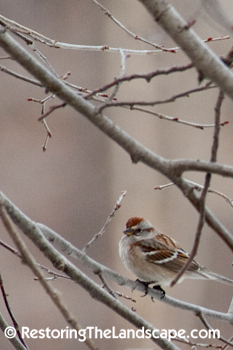 We saw several sparrows for the first time this season, Song Sparrows were singing from the cattails in the wetland, closer to shore was the American Tree Sparrow (pictured on the left), and the rusty-red (and much larger) Fox Sparrow. A pair of Yellow Bellied Sapsuckers were hanging around the yard most of the day pecking away at the Big Tooth Aspen, Buckeye, and Eastern Red Cedar trees. Other first bird sightings of the season this weekend included Killdeer, Kingfishers, Wood Ducks and Brewer's Blackbirds. 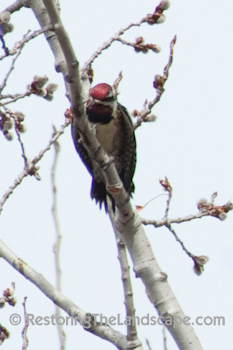 What returning birds did you see this week? 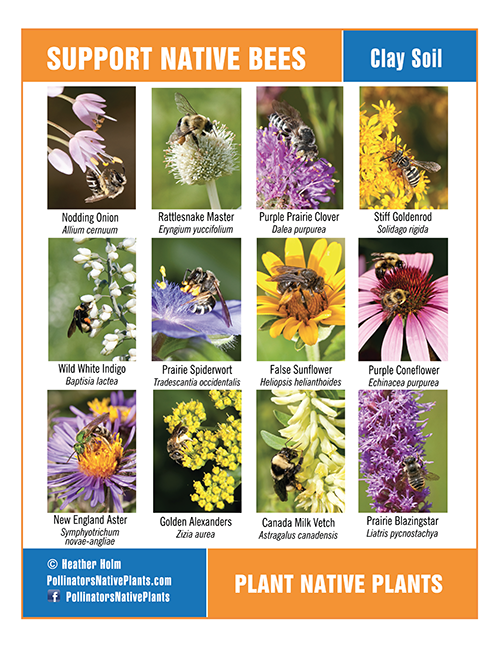 I regularly speak to garden, landscaping and native plant groups in the Midwest and Great Lakes area. Trying to Identify a Plant? 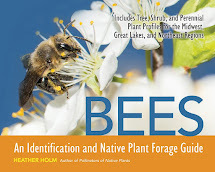 Restoring The Landscape With Native Plants by Heather Holm is licensed under a Creative Commons Attribution-NonCommercial-NoDerivs 3.0 Unported License. 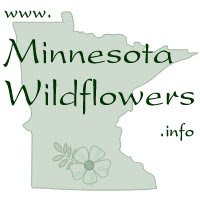 @ 2015 Heather Holm | Restoring The Landscape With Native Plants | . Simple theme. Powered by Blogger.